As a result of the U.S. government shutdown, the U.S. defense budget will not be released next week as planned. Despite the fact that the 2019 defense budget was passed on time (for the first time in a decade), a shortfall of Office and Management personnel during the shutdown has disrupted the timeline for the release of the Pentagon’s 2020 request. Some rumors suggest the budget release could be delayed by as much as one month, about the amount of time a portion of the government went unfunded during the shutdown. Onlookers are eager to see where the defense topline budget comes in for 2020. The administration had been planning to release a $733 billion national security budget request for 2020, a figure that includes some funding for national security programs outside of the Pentagon. However, the president subsequently called for 5 percent reductions for government agencies, at which point he called the $716 billion allocated for national security in 2019 “crazy,” and said the defense budget request would be around $700 billion, instead of $733 billion as planned. Before his departure from the Pentagon, Defense Secretary Jim Mattis and the Republican heads of the House and Senate Armed Services committees ventured to the White House in an attempt to reverse the cut, and were reportedly granted a $750 billion topline by the president. However, the government has not formally announced its 2020 defense figure, so it remains to be seen exactly where the topline will be. Of course, all of the numbers being thrown around are well above the $576 billion cap on national security spending in 2020 established by the Budget Control Act of 2011, a piece of deficit reduction legislation intended to curb the growth of the federal debt. Congress has increased limits on defense and non-defense programs multiple times since then through a series of two-year budget deals. The BCA limits remain in effect for another two years, meaning additional negotiations will be required in order to modify the caps in 2020 and 2021. It is important to note that the White House’s original $733 billion projection for 2020 included $73 billion in funding for Overseas Contingency Operations. That OCO funding is not subject to BCA spending caps, since lawmakers did not want to place limits on money intended to support troops in combat. If you remove the OCO figure from the equation, lawmakers would have to increase 2020 spending caps by approximately $84 billion to reach the $733 billion mark, or by some $101 billion to reach $750 billion. The last two-year budget deal increased defense spending limits by around $80 billion in FY18 and $85 billion in FY19. The $80 billion increase for FY18 alone was larger than all of the increases over the previous four years combined. Another option in the playbook is to shift additional money to the OCO account, which can serve as a loophole to bypass BCA spending limits. The OCO account (previously known as the global war on terrorism, or GWOT, account) was originally intended to cover truly unanticipated war costs in the years after 9/11. However, the account slowly transitioned away from that original purpose, serving as a crutch for the base defense budget. 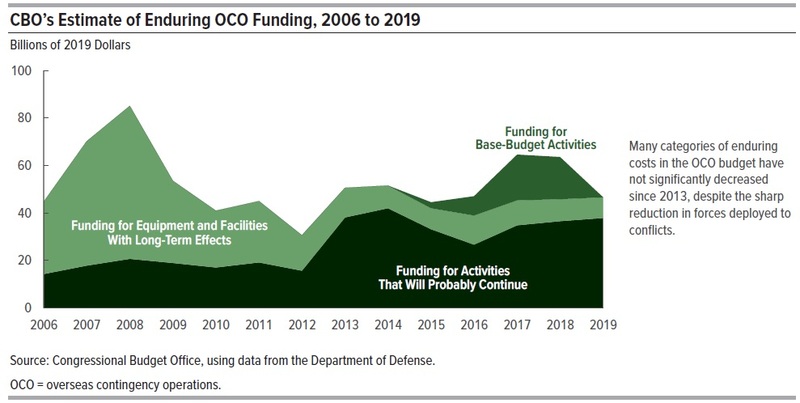 In fact, last year, a Congressional Budget Office report estimated that only 30 percent of the Pentagon’s $69 billion OCO request for 2019 was supporting actual contingency operations. The remaining 70 percent, or around $47 billion, represented enduring costs that would likely remain even if troops left Iraq, Afghanistan, or Syria, including funding invested in procurement programs that would incur long-term costs. At one point, the Obama administration said it wanted to migrate these enduring costs into the base budget, but that never happened. There was talk that the Trump administration would make the same shift, particularly because Mick Mulvaney – Director of the Office of Management and Budget and Trump’s acting chief of staff – has been a long-time critic of the OCO loophole. However, such a move is unlikely to take place while the BCA caps are still in effect. Since OCO funding is immune from spending limits, every dollar shifted from the OCO account to the base budget would have to be accounted for in any BCA-altering deal for FY20 and FY21. Reaching a 2020 budget deal will be no simple task. Democrats now control the House, and House Armed Services Committee Chairman Representative Adam Smith (D-Wash.) has questioned the need for a larger defense budget. Democrats have gone along with defense increases in recent years because they also received additional funding for domestic programs, but the latest budget deal to alter spending limits added a massive $296 billion to the federal deficit over the course of two years. It remains to be seen if lawmakers will pursue a budget deal of that size a second time.